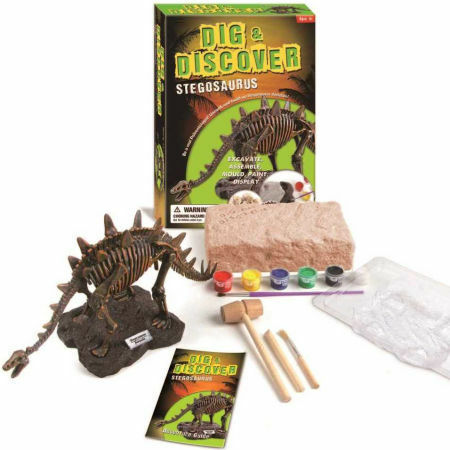 Dig Discover Dinosaurs Stegosaurus is a craft kit which contains everything you need to excavate paint mould and display a Stegosaurus. First you dig the dino skeleton out of the plaster using the tools supplied then assemble the bones. You then paint your Stegosaurus with the paints and brush. Finally the plaster from the excavation can be used to mould a base so your creation can be displayed. We like this because: "Lots to do. A very well designed kit"